Domain spam that originates in China can be quite annoying, as the “Chips” game spread globally during the past 18 months. Direct inquiries about a particular domain are generally ok, but robo-spamming the entire AAAA-ZZZZ sequence is not cool at all. So the Chinese spammer offering 1000 RMB or about $150 dollars for a premium four letter .COM domain is hiding at mihuishou.com and the QQ 2385638010. Keep that in mind when you receive similar spam emails for your premium domains. 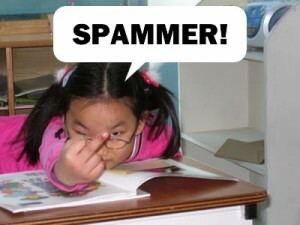 Domain spamming is no different than any other kind of spamming; it’s abusive and despicable.